Experts from the Swiss bank, USB counted how much all the standard must-haves of a fairly young and trendy person cost. In the experiment, the 8 most popular items among young people in the 11 biggest cities of the world were compared. Warning! If you think that you’re a young person but what you have is very different from the things on this list or you think that these things are not necessary to have, please note that this is an average list based on information from all around the world. Of course, there are different cases and situations but this article is not about those. Today, we’re talking about the exaggerated image of a trendy person in the 21st century. So this is what we have so far: jeans at an average price, sneakers of a famous world brand, a basic Netflix subscription, an iPhone X, and our favorite, the avocado. It may be surprising, but the easiest life for a trendy person is in one of the most expensive cities in the world. Here, you can buy amazingly cheap iPhones (just $9 more than in the country of its origin) and laptops that pretty much dominate this list. Big Macs are also cheap here! This city of skyscrapers in the middle of the desert, full of cheetahs and Sheikhs is also incredibly cheap if you want to buy these items. This city (the destination for hangover parties) seems to offer cheap food and drinks. This is the motherland of almost a third of the things on the list. Based on what things cost here, this price list seems logical. The fashion capital has high prices for clothes and shoes, but it’s not the same for devices. These Canadian prices are not surprising. Nothing to really say about it except for the fact that coffee is pretty cheap here. It’s all pretty straightforward with Switzerland: If you want to buy some clothes and then go to McDonald’s, this is not the place you should go to. They also have the most expensive Netflix subscription there. It’s quite expensive for a millennial to live here. Unexpectedly, the Russian capital is one of the most expensive cities for millennials: there, both clothes and devices are very expensive. And with the cheapest Big Mac in the world, this doesn’t make the situation any better. The cheapest coffee and the most expensive laptops — this is what’s going on on the other side of the planet. 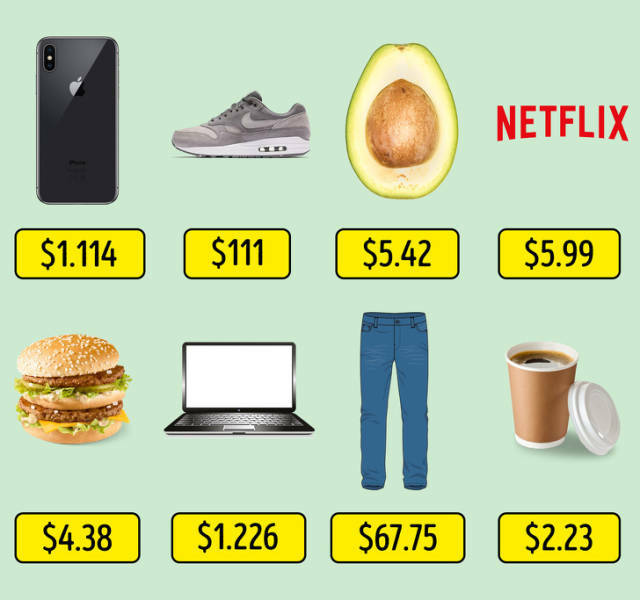 Cheap coffee, cheap avocados, cheap jeans... and an iPhone that costs $2,243! This is almost 2 times more expensive than in the U.S. Argentinian hipsters must have a difficult life thanks to these Apple product prices!